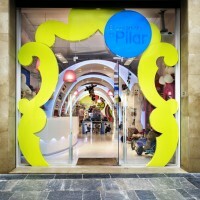 Spanish designer Elia Felices has completed the interior of a toy shop in Barcelona. 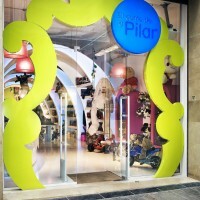 “Pilar’s story, located in Mataró (Barcelona), is a retail outlet for all kinds of articles for children – it is a new kind of toyshop. Covering an area of 170m2, distributed between the ground floor and basement, it is a space full of magic and surprises that seems to have sprung from a children’s story. There is a rainbow and out of scale objects, all suggesting the world of the imagination. This idea, which is the main feature of the project, makes use of real elements to create an enchanting environment. The objective is to enter a new world that is attractive to children as well as adults. 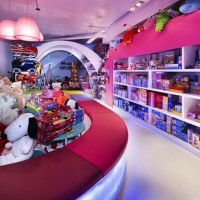 The principal user of the products sold in toyshops are children, but the space must be an attraction for persons of all ages. From the very first moment, we have tried to understand how children see the world in order to create a space which addresses their concerns. We have projected a space full of elements that will take adults back to their childhood, a period that we all have lived through, and in which children feel completely comfortable and at home, as if their dreams had come true. It is impossible not to notice the façade at first sight, and its elements inspire curiosity on our part. It consists of the frame of a mirror that marks off the interior and simultaneously invites us to cross it to enter the shop. Another circular form joined to the arch contains the backlit logotype of the establishment. The visitor passes through the frame to a fantasy world, as in the children’s story of “Alice through the looking glass”. Together, these frontal elements act as the threshold, marking the frontier between our world and the world of fantasy. The colours that personalize the project are the lime-green already present in the frame of the front and pink fuchsia. Both contribute happiness, vitality and energy to the project, in addition to combining to the perfection with the surrounding white of the whole space. The above-mentioned colours give small touches of fantasy that are further complemented by the lighting. Once inside, the project consists of modern style curves that enhance and enlarge the space, giving it a spirit that is childlike, yet simultaneously elegant and measured. 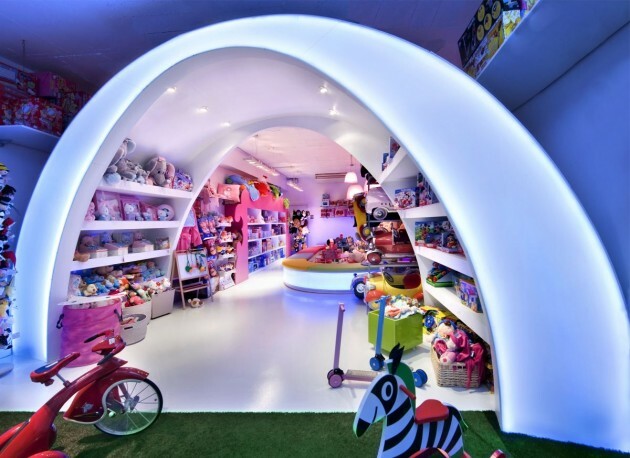 The space of this new kind of toyshop is therefore distinct from other establishments of this type, creating a new experience that is also an added attraction of the toyshop. On entering, we are faced with the counter, in the form of a big cake complete with a candle. This exclusively designed lamp gives a nice touch to the giant cake while illuminating it as a birthday candle would. The counter is the element that either welcomes us to the magical world that awaits us, or sends us back to the real world by crossing the frame again to go out of the store. To the right of the entrance there are a few large-scale abstract figures with funny legs which function as a display case to keep and to show small products. After the counter and the display cases, we move into the most noticeable elements of the place. The displays contain shelves at different heights which are always open to the client and which allow the product to be displayed neatly. 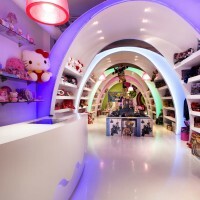 Four successive arches contribute depth and colour to the space and lead the customer onwards to the end of the store. The lighting of the arches consists of RGB Leds offering different combinations and ranges of colour which make it possible to create the effect of a rainbow. We cross the rainbow as we decide to advance across the space. Light is also one of the protagonists of the project. Along with these effects of changing colours and shades, we find hanging lamps that emerge from the ceiling between the arches, adding more light and colour. Nor must we forget the technical lighting, which is as important as the decorative and environmental sort. For the lighting of the shelves, we have used a few adjustable spotlights fixed in the roofs of the arches, creating a general illumination beneath the arch and also directed towards certain shelves. As for the rest of space, white arrays of adjustable spotlights hang down to illuminate more specific areas. They are on either side of the entrance, above the counter and display cases, and at the rear, just before the stairs leading to the basement, where we also find them in the exhibition areas. The toilet is located inside a green prismatic block at the rear of the store which forces us to move to the right and directs us towards the stairs. A mural full of shapes and colours which can be seen from the doorway runs alongside us as we go down to the basement. It combines green, pink and blue with coal black against a white background. Downstairs a few splashes of colour tell us that something is going on in this underground space. First we come to an open space for large toys and another arch-display case. Under the arch, there is a shelf which reminds us of the mirror frame on the façade. Again, it stands out for its sinuous but elegant forms and for being pink like the decorative lamps that invade the space just ahead. A huge multi-coloured bench cannot go unnoticed. It is a closed form that creates a space where children’s stories can be told. 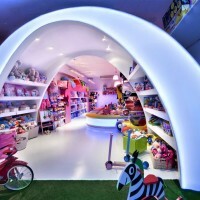 It gives off a gentle blue light like a swimming pool and creates an island where children can make themselves comfortable and listen to stories, an activity offered besides that of buying toys and gifts. So we discover that other activities are available in the basement as part of our adventure in this imaginative world, besides the opportunity to buy the products on sale. Finally, we must emphasize that all of the furniture is exclusive and custom designed for this project. This created fantasy world is innovative and new in every aspect. Visit Elia Felices’ website – here.